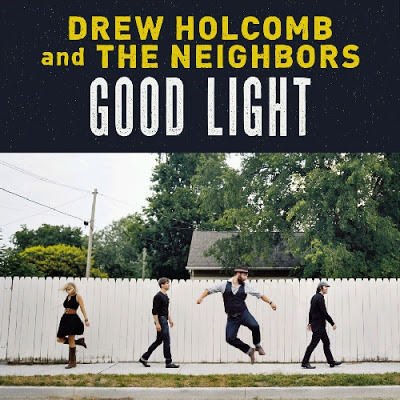 Good Light, Drew's fourth studio album and his third with The Neighbors (Ellie Holcomb, Nathan Dugger, Rich Brinsfield), is essentially a love letter to his wife, his baby girl, and his home state of Tennessee. Showcasing Drew's signature brand of singer/songwriter Americana in its finest form yet, Good Light was recorded live at Memphis' Ardent Studios and arrives shortly following Drew's 30th birthday and the birth of his first child, daughter Emmylou with wife/bandmate Ellie. While Ellie was pregnant, Drew wrote more than 40 songs for the record, mostly alone on his 1934 Gibson Archtop, eventually whittling the selections down to a final 12 tracks. The result is the band's most realized album to date. Since releasing his first solo album, 2005's Washed In Blue, Drew - later joined by The Neighbors - has established himself as a formidable indie act, selling more than 75,000 records, playing more than 1,500 live dates, selling-out headline shows, touring alongside such varied acts as Los Lobos, NEEDTOBREATHE, Susan Tedeschi, North Mississippi Allstars, Marc Broussard, and more. The band's songs have been used in countless television shows and commercials, most notably in TNT's Emmy Award winning 2011 NBA Forever spot (called "timeless" by Sports Illustrated and dubbed "the greatest NBA commercial of all time" by The Bleacher Report) which featured the song Live Forever. Following the release of Good Light, the band embarks on a headline solo tour before joining NEEDTOBREATHE on tour through May 2013.